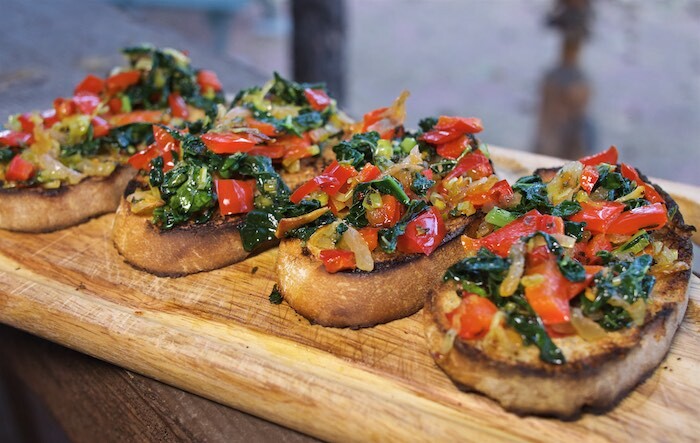 Crostini, like bruschetta, are one of those easily adaptable, fun to eat appetizers that are perfect for parties. The array of flavors, from the kale to the prosciutto, in this particular crostini is a delicious and surefire way to please a crowd. Though long, believe me when I tell you this recipe is worth the the effort. Drizzle mushrooms with olive oil, place on a baking sheet and roast for 20 minutes. Remove from the oven and allow to cool. Once cooled chopped into pieces and place in a bowl. Add the sage and garlic, season, and set aside. In a 10 to 12 inch saute pan, heat 2 tablespoons of the olive oil over high heat. Add onion and cook until translucent. Add the red peppers, thyme, and oregano, and sauté until the peppers are very soft, about 5 more minutes. Transfer to a bowl, season with salt and pepper, and set aside. Heat 2 tablespoons of the olive oil in the same pan over medium heat until smoking. Add the kale and red pepper flakes and cook, stirring, until the kale is wilted and soft, 4 to 5 minutes. Add 1/4 cup water and stir quickly as it steams and softens the kale, cooking until the water has completely evaporated. Transfer the kale to a bowl, add the prosciutto, and set aside. Wipe the pan clean. Heat 2 tablespoons olive oil in the pan over medium heat. Add the leeks and cook, stirring occasionally, until very soft and translucent, about 10 minutes. Transfer to a bowl and allow to cool. Add chopped mint to the leeks. Season with salt and pepper and set aside. Once everything is cool, combine together and top toasted bread with a heaping tablespoon of the mixture. I have to remember these for my next party! They are the perfect appetizer! Those look delicious! I bet they'd make a great appetizer or lunch! Soooooo much flavor in every bite! YUMMM. And paired with a glass of red wine? Yes, please!! I'm obsessed with crostini! This recipe will definitely be made soon since I love everything about it! LOVE all of that kale + mushroom goodness! So yummy and the perfect crostini! Beautiful! A perfect party or date-night app or light meal! I do something similar with spinach on ciabatta. love Crostini! I love all of the toppings on this! Can't wait to try it!